This week, I managed to finish . Not long ago, I listened to Harari’s interview on the James Altucher show that introduced some of the concepts in his next book, Homo Deus. That book picks up on some of the threads presented at the end of Sapiens; I look forward to reading it next. Sapiens was for me personally, very engaging. While it was long, it wove a narrative that bridged a number of my personal passions: ancient history, anthropology, language and technology. The book is long, rich and complex and I am not going to attempt to summarize it all, but I did want to capture a few of the key themes I took away. Something about homo sapiens allowed us to outlive several other human species that walked the planet at the same time. 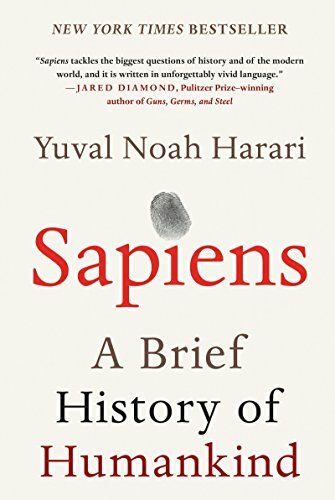 Harari doesn’t pick a side, although you are left to determine for yourself whether you think this was due to evolution, luck or some intelligent design. The important thing is realizing that mankind did not have to turn out the way it did. In fact, even the word “mankind” is misleading as we are but one branch of mankind. Our discovery of farming, specifically of wheat, put mankind on a path away from its hunter-gatherer roots. We began to become stationary people. We grew in numbers and required greater numbers to farm more wheat, to feed more people, and so on. This concept was incredibly powerful for a number of reasons. Not only did we set ourselves on a path away from our original skills, but we became highly dependent upon a food source which was initially more rare to come by, due to its fussy growing behaviors. By nurturing wheat, we effectively became a slave to it. From kingdoms, to religions to politics, homo sapiens have managed to scale the growth of society through the creation of hierarchical tribes. We first learned as a people that we could stay safe in numbers. Then we realized we could amass more food. Ultimately, we realized we could accomplish greater feats of building and conquest as we developed larger tribes. Ultimately we created the concepts of nation and religion to justify our new roles. It’s easy to forget that our ancestors were once in the middle of the food chain: larger than some animals, but ultimately easily killed by larger beasts that roamed the earth. Over time, we would develop the tools and organization to drive those beasts to extinction and ultimately sit where we are today: in command of the global food chain. Since the industrial revolution, homo sapiens have been accelerating in their understanding and mastery of the world at a speed which had never been known. We now have the ability to create life, organically and inorganically. This suggests that we are likely very close to breakthroughs that will change the future development of humans. I love controversial titles, and this was no exception. As you can probably infer, there are a number of arguments contained in the book that can rankle those of different political or religious persuasions. Overall, I felt that it was a mind-opening book that provided an updated history of civilization while dipping into futurism to suggest where we might as a species be going. Note: There are some glowing and some harsh reviews of this book out there. I’m not saying its perfect, but I think it’s worth spending some time with. I look forward to hearing your opinion. Get in touch or leave a comment to let me know your thoughts. I hope everyone enjoyed a safe and relaxing 4th of July weekend. We had a great time visiting with friends and family and getting recharged. This is not so much a full post; I’m just sharing a few thoughts and a handful of links to interesting reads and bits of news from the last few days. My boys and I watched the fireworks in our neighbors’ yard on Saturday night from their bedroom window. What amazed them most was not the fireworks themselves, but the thick plumes of smoke that rose up and wafted through the tall forest that surrounds our home. Later that evening, as I took the trash out to the curb, I could smell the heavy smell of gunpowder mixed with rain. It’s a smell that you get perhaps once a year, but it takes you back to the last time as soon as you notice it. I still think that smell might be the most powerful sense of all. Last night we were home before any fireworks began, but a proper barrage started as they lay in their beds getting ready for sleep. They thought it was a thunderstorm, and Jen and I were happy to let them think as much in order to get some rest. If like me, you’re into podcasts and where the medium is going, you may be interested in this new development from the folks at Podbean. Their new advertising program allows brands to get placements on Podbean hosted shows that are read by the show hosts themselves. Select shows offered this before, but this is a nice benefit for a network. The latest issue of the Hotpod Newsletter from Neiman Journalism Labs is out. Particularly fun is the included profile of the Relay.FM podcast network. I was featured on a fun live interview last week with the team at Carpool Talk Show. Stay tuned for the replay link. Legendary author and holocaust survivor Elie Weisel, passed away this weekend at the age of 87. What amazes me is that he actually wrote 57 books; something which seems to be glossed over given his most famous recounts his experience in the Auschwitz concentration camp. Check out these powerful recaps of his life from the New Yorker and New York Times and get a sense of what is lost now that one of the few remaining witnesses passes away. In a bizarre twist today, the leader of the KKK, David Duke responded to (and seemingly condoned) an antisemitic tweet from Donald Trump. I’m listening to one of my favorite all-time albums, the HELP charity album for the war in Bosnia. It’s a fantastic collection of music, pulled together to support aid for a particularly dark time in recent history. This article from the Guardian recaps the history of the project fairly well, 15 years on. © 2001-2016, Adam Monago. All Rights Reserved.